My earliest idea of the boat that brought farmor (Grandmother Lundgren) to America. The first 180 degrees of the circle whose closing will be the first subject of this website were created by emigranterna (the emigrants) Anders Håkansson, Hanna Swenson, Oscar Lundgren, and Hulda Jäderqvist each of whom deserves and I am sure will get at least one story here. At this stage of my life, when I meet almost daily emigrants from all over the world, I have begun to think more often and more reflectively about the emigrants within my own family. Therefore I begin here with a drawing that I made when we lived in the house that had been the home of emigrants Oscar Lundgren and Hulda Jäderqvist Lundgren and their many children born in det nya landet, America. "Min farfar" Oscar Lundgren died two weeks after I was born in mid Mid March 1932 so I never knew him. For reasons I can only speculate about, we - Larry Sr., Hope, Ron, and me Larry Jr. - moved from the city of my birth, Attleboro, Massachusetts to live in the house owned by "Farmor", now the widow Hulda Lundgren. I begin with the drawing to illustrate the importance of stories. 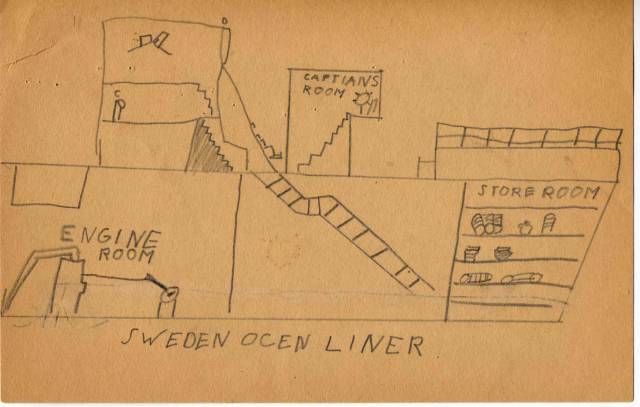 It is evident to me that stories told by my grandmother Lundgren (Gramma Lung to the cousins) about the country of her birth and/or about her emigration from that country to America led me one day, probably upstairs in her living room, to make this drawing. I remember none of this, but what I do remember, closely connected to this drawing, is that while still a chld in Rumford, I made a kind of promise to myself-maybe a challenge. when that day came, maybe even learn to speak Swedish. By so doing, I would close the circle described above.I finally did learn Swedish and after first traveling to Finland and Sweden in 1967, I moved to the house in which I am writing this, Apelgatan 7 in Linköping, Sweden. Learning Swedish made many things possible, and the first I want to name is that it made it possible to read and translate for others the letter that came in the envelope you see to the right. I think that each of the emigrants I have named so far deserves at least one story, and since Anders Håkansson, the writer of brevet till Hanna (the letter to Hanna) I will begin with him but not tonight. There is a link in the column to the right that will take you to the page where the story of Anders and Hanna begins . My grandmother Baker's father, called Hokanson in America, was Anders Håkansson in Winslöf in Skåne where he was born. 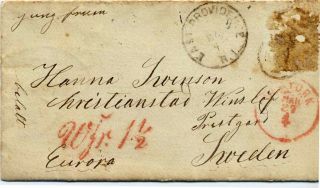 Envelope addressed to Hanna Swenson in Winslöf, Sweden.